A couple weekends ago, Matt and I stopped by the Modern Cafe for dinner. While there we tried their amazing brussels sprouts special, brussels sprouts and pork belly with a cheese fonduta. 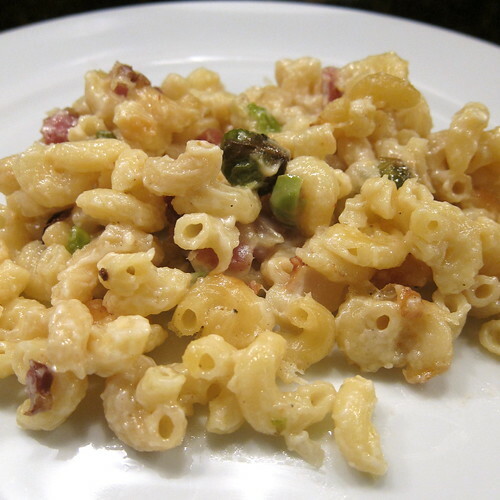 I had the flavors of that dish in mind when I made this mac and cheese. This was such a great combination. The brussels sprouts get roasted before being added to the cheese sauce to soften them and give them a slow roasted nutty flavor. I used the bacon fat to make the cheese sauce which really bumps up the flavor. 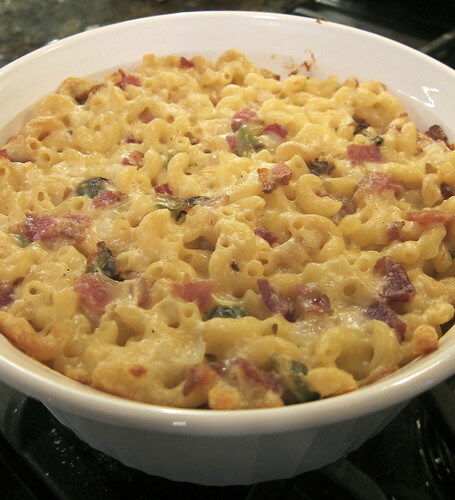 This version of mac and cheese has found its way into our winter comfort food rotation. Bonus, I think this would be a great way to get someone who isn't the biggest brussels sprouts fan to give them a try, I mean what isn't good covered with cheese and eaten with bacon?! I often make mac and cheese early in the day, put it in the casserole dish, cover it then leave it in the fridge until I'm ready to bake it for dinner. Put the brussels sprouts in a small roasting pan. Drizzle with enough olive oil to coat them. Roast in the oven for 20 - 30 minutes until softened and browned. (The time will depend on how small you cut your sprouts. Keep an eye on them as they can burn quickly.). Set aside. Cook the macaroni according to the directions on the box. Drain and set aside. In a large saucepan, cook the bacon over medium-heat until it has released its fat and is crisp. Use a slotted spoon to remove the bacon to a paper towel to drain, leaving the fat in the pan. Check to see how much fat is in the pan, you want about 1 tablespoon. If you have less than that add a little butter to make up the difference. Add the onion and sauté until translucent. Sprinkle the flour over the onion. Cook while stirring for 1 minute. Slowly stir in the half and half. Stir until the sauce is bubbly and thickened. Add the cheese and stir until melted. Stir in the mustard, worcestershire and pepper. Add the bacon to the sauce. Taste for seasoning and add salt as needed (the amount will depend on how salty your cheese and bacon are). Stir the brussels sprouts and macaroni into the sauce. Pour the whole mixture into a large casserole dish and bake at 350F for 30 minutes. It should be golden brown on top with lots of nice crispy bits. I just have to try this. Growing up, my mom boiled the hell out of Brussels Sprouts. I hated them, which has carried over into adult life--but I've never tried them roasted. I need to! Elle - I used to think I hated them too then I tried them sautéed with some garlic and bacon at the Half Moon Bay pumpkin festival & I was sold! Seriously brussels sprouts require some caramelization or bacon in order for me to eat them. This looks right up my alley. I always want to try using brussels in new ways because we get tons from our CSA. Yum! Two of my favourite foods together! Thanks. Mmmm. Mac and cheese in the oven. I made a special trip to the farmers' market just for Brussels sprouts.